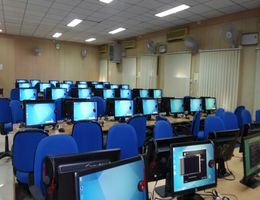 Guwahati: ICAR-Central Inland Fisheries Research Institute (CIFRI), Barrackpore organized an Interactive workshop on ‘Openwater fisheries management in NE region’ during 12-13 Feb, 2019 at its Regional Centre, Guwahati under NEH component of the Institute. A total of 60 officials representing Directorate of Fisheries, Govt. of Assam, Meghalaya and Arunachal Pradesh; Assam Fisheries Development Corporation Ltd., Guwahati; FISHFED, Govt. 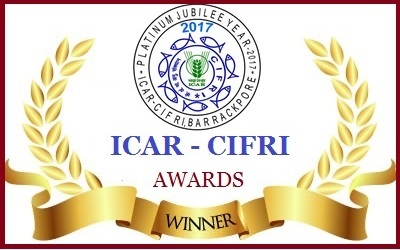 of Assam; NFDB Northeast Regional Centre, Guwahati; NABARD Assam Regional Office, Guwahati and Scientists/ Researchers of ICAR-CIFRI participated in the programme. The programme started with the lighting of lamp. Dr. B. K. Bhattacharjya Head of Centre of ICAR- CIFRI Regional Centre, Guwahati welcomed the participant and dignitaries for the workshop. The workshop was presided by Dr. B. K. Das, Director, ICAR-CIFRI, Barrackpore. He explained the background and purpose of the workshop and stressed on the development openwater fisheries in the region for increasing fish production in a sustainable manner. Dr. S. C. Pathak, Former Chief General Manager (CGM), NABARD Regional Office, Pune graced the function as Chief Guest. He urged all the state fisheries departments of the region to work unitedly with the common goal of achieving self-sufficiency in fish production through concerted efforts of all R&D agencies. Dr. Usha Moza, Former PS of Fisheries Division, ICAR, New Delhi graced the function as Guest of Honour. She emphasized on the need for making the NE region self-sufficient in fish production by utilizing all available fisheries resources. Mr. P. K. Hazarika (Project Director, AFDC Ltd., Guwahati), Mr. J. K. Samal (DGM, NABARD Regional Office, Guwahati) and Ms. Dipmala Roy (Officer In-charge, NFDB Regional Centre, Guwahati) graced the function as Invited Guest. The technical session of the workshop was chaired by Dr. S. C. Pathak Former CGM, NABARD Regional Office, Pune. 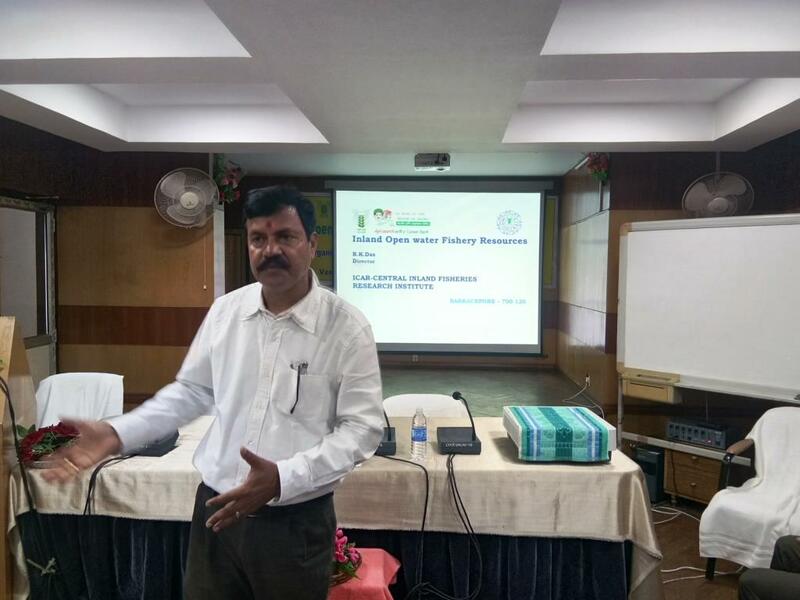 Dr. B. K. Das delivered the theme lecture of the workshop on “Role of ICAR- CIFRI in development of openwater fisheries resources of India”. Dr. B. K. Bhattacharjya, delivered a lecture on “Strategies for Scientific fishery management of openwater fisheries resources of NE region”. 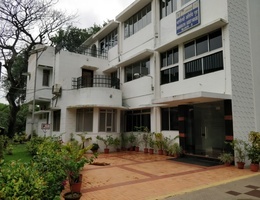 Mr. J. K. Samal of NABARD, Dr. B. Lahon of NFDB, Dr. S. Yengkokpam, Dr. Pronob Das and Dr. S. Borah of ICAR-CIFRI delivered lectures on different areas including Institutional finance, NFDB schemes, pen culture, cage culture and stock enhancement for openwaters, respectively. 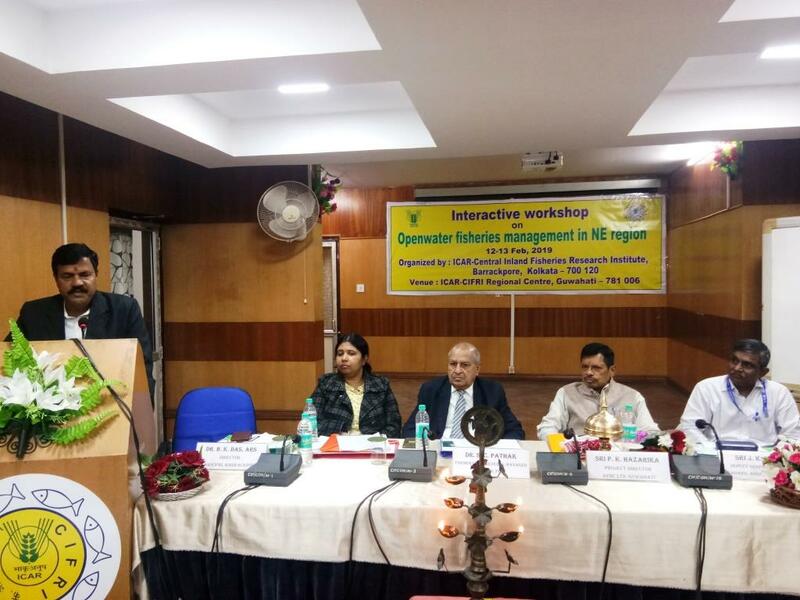 The valedictory session of the workshop was graced by Dr. S. C. Pathak, Former CGM, NABARD Regional Office, Pune as Chief Guest. He stressed on learning from fishers and be innovative in our approach. Dr. A. K. Tripathi, Director, ATARRI, Zone-VI, Guwahati graced the function as Guest of Honour. He assured to extend full support for training of fishers, capacity building of officials and developmental activities through KVKs in the region. Dr. B. Lahon, Senior Consultant, NFDB Regional Centre, Guwahati graced the function as Invited Guest. He also assured to extend financial support from NFDB for development of openwater fisheries in the region. Dr. P. Das, Organising Secretary and Scientist of the Centre presented a brief report of two days’ workshop. The programme ended with formal vote of thanks proposed by Mr. S. Borah, Scientist of the Centre.